Bill Murray, having recently been relieved of his post as sentinel for a Chicago Cubs World Series win, continues his unofficial tour of America. The actor-comedian took in a Lupe Fiasco concert recently, even joining the artist backstage. But Murray isn’t just looking to hang with the cool kids—he wants to meet their even cooler grandparents. 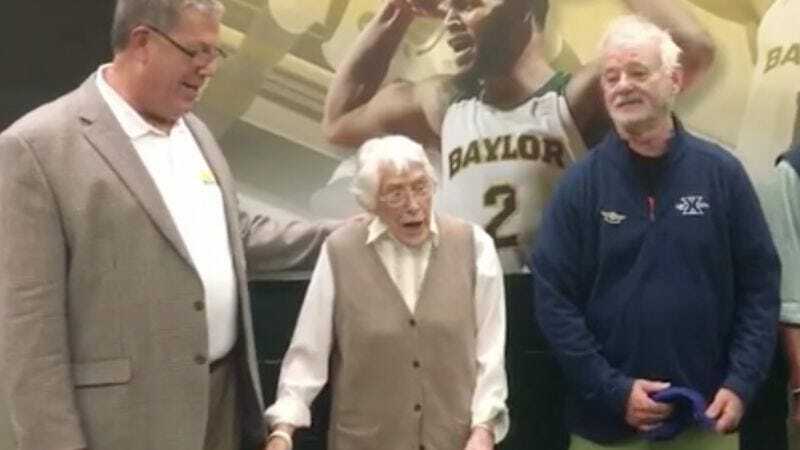 While attending the Baylor vs. Xavier basketball game last weekend, Murray decided to drop in on Maryellen Wible’s birthday party. He joined her family in singing a rousing rendition of “Happy Birthday,” which people can now perform in public without fear of reprisal. That must have been a nice additional present for Wible. Murray was no good luck charm for his team, Xavier, which lost to Baylor. But he was a sport about the whole thing, even posing for pictures with the winners. And in other Murray news, he hung out with Chuck Norris in Texas—but just for fun, not for a Walker, Texas Ranger spin-off.